This article is about the stage preview mode. For the Ability, see Recon (ability). Recon is a single-player mode that allows players to explore a stage of their choice from the current rotation. It can be accessed from the Battle Lobby by pressing when selecting the Regular Battle, Ranked Battle, or League Battle options. This is useful to find new vantage points, turf, or just to try out a new map. There are no allies or opponent players. Ranked Battle matches cannot be ended early by meeting the knockout criteria. In Splat Zones, the Zones can be inked, but there is no countdown. In Tower Control, players can ride the Tower to the opposing side, but nothing happens except the music stopping when it reaches the goal. Since there are no players to go against, the Tower will never get any closer to the player's side of the map, unless it moves back to the center of the map. In Rainmaker, nothing happens when reaching the goal while holding the Rainmaker. In Clam Blitz, the player can open the basket and throw clams but they are not counted for. The mode can be ended early by pressing through a pause menu, which itself is impossible in multiplayer. The music tracks that play in an online battle do not play. Since there is no music in Recon mode, different sounds can be heard, such as cars whizzing past in Blackbelly Skatepark or the sounds of jellyfish testing video games in Ancho-V Games. The player is always on Team Alpha. This usually does not make any noticeable difference, with some exceptions. 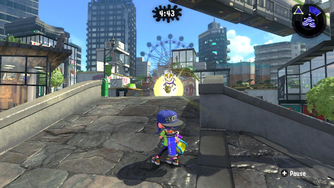 In Saltspray Rig, the player will only start on the right side of the map. In Splatoon 2, this is more visible, since the decor for stages is not symmetrical: usually, some props are replaced by different, same-sized props on the other side. For example, in Shellendorf Institute, the player will always start on the side of the entrance and not the side of the gift shop. However, if a player plays on Recon mode during a Splatfest, they will start on the side that matches the team they chose. If a player chooses Marie or Marina's side, they will end up on Team Bravo's side instead. Due to the mode being single-player, the player can explore the stage without any lag and have much smoother movement with their character. If a player chooses Recon mode during a Splatfest, the stage appears at night, although this is only possible in Splatoon 2 due to the ending of Splatfest events in Splatoon. In Recon mode, the Turfed Ink score of the main weapon used is not updated after leaving. Rainmaker is the only mode in which it is possible to get splatted. Touching the Rainmaker Shield repeatedly deals damage, while carrying the Rainmaker for too long still splats the player.